I honestly doubt that this little guy is going to be scaring anyone! He's so damned cute! When I saw the new release from C.C. Designs I had to buy it, and thankfully it was timed right during a sale, so I picked up a few more. You can see the haul here: C.C. Designs Haul. After my (pretty bad) visit to the doctors on the 5th, they wanted to hospitalize me but instead put me on LOTS of meds, I needed a pick-me-up so I took this guy out and started to colour. The meds screw me up pretty well, so I had to go in stages, but slowly working on the colouring, and playing around with the glow of his lantern, it went a long way to helping me feel better. That's the power of art, right? Making things, doing things, just the distraction is all you need to feel better sometimes. 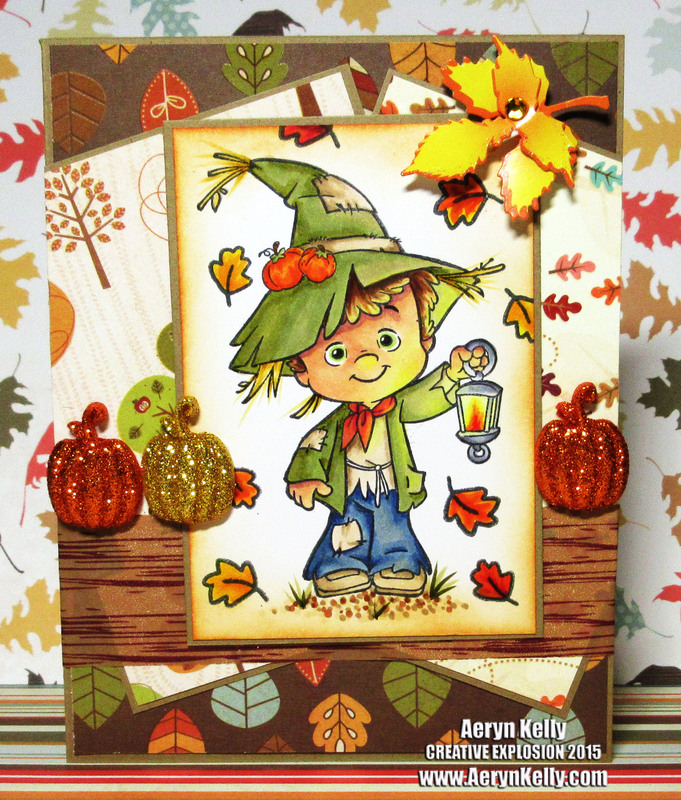 Once coloured and grounded, I stamped some little leaves around Henry, dusted him with some Rusty Hinge Distress Ink, and used one of my older, beloved Imaginisce Fall lines to make this card. I only have scraps left, but I don't want to let this collection go, especially when it works so well with images like this! I hope you like this card, and you're enjoying the Fall/Autumn season! Never let those Copics alone for too long, Marchelle! You just can't. You owe it to yourself to get as colourful as you can. :) Thanks for your compliments, you're very kind! Thank you, Nancy. Yes it's always good to get a little distraction from reality, eh?